Caravan sites can range from fully serviced to partially serviced. It is a good idea to check your site’s requirements when you arrive. In addition, there are several useful items that can help you to set things up exactly as you like them. A requirement on many sites and a good idea on all. The red fire buckets are usually filled with water or sand and are there to assist in case of fire. Don’t attempt to fight the fire, instead always focus on getting everyone clear. However, they can be useful in preventing a fire from taking hold if caught early enough. If your caravan isn’t sited using a spirit level you may find that your plates slide a bit on the table and you’ll also put unnecessary extra weight on the corner steadies. A simple spirit level should help you ensure that your caravan is level. A water container is the most popular method for obtaining fresh water when running water isn’t available. These can be filled up at the fresh water points and then connected to the caravan using the pipe. Choosing a cylindrical container, like an Aquaroll, will make the journey from the water supply to the caravan much less strenuous. Even if you have a fully-serviced-pitch you may need the connecting pipe. Be careful buying any water and waste containers second-hand and be very careful to sanitise everything thoroughly. If in doubt, throw it away and buy a new one! Similar to the water container, only not as pleasant. The waste container does what it says and should always be treated with the appropriate chemicals and only disposed in the correct location. Ensure you check with the site wardens as the locations and chemicals require can vary. Do not dispose of this near the fresh water! LPG is the most common fuel source for caravans and comes as either butane or propane, choose the one that’s right for you. 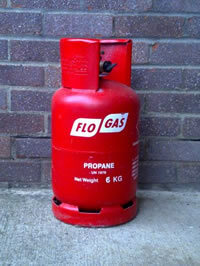 LPG is contained in pressurised gas bottles and a regulator will need to be used, whether on the gas bottle or fitted to the caravan, to prevent damage to the appliances. Be very careful as LPG is very dangerous. When you get your first gas bottle you can choose between rented and refillable ones. For someone starting out, it might make sense to buy a refillable one to last a lifetime rather than pay a deposit on one, the deposit can always go towards the cost of a refillable type. Many campsites now feature electric hook-up (EHU) points to allow you to use mains electricity when on site. Make sure you know how to hook up to an EHU point. A lightweight caravan step can save you a lot of strain as well as avoiding the risk of falling. Some of the steps come with handrails, to provide even better accessibility to your caravan. If you’ve not been camping or caravanning before you may be surprised at how dark it can get in the countryside; take a torch for those late night walks to the wash block, or if you need to find something outside. For putting down the corner steadies, check that it’s long enough to reach your corner steadies as some can be situated in further from the edge of the caravan. A decent leisure battery will allow you to have a reliable source of electricity for a while whilst you’re not connected to the mains. When used in conjunction with LPG you can happily survive a long weekend away from any facilities and still enjoy your caravans equipment and appliances. A C-tek charger or smart charger can be left on all the time, so you can leave your battery on charge and not worry about overcharging the cells. A worthwhile investment as leisure batteries can be expensive to replace if damaged. A cordless drill comes in handy for all sorts, with an adaptor for winding steadies or a long 10mm masonry drill for pilot holes for rock pegs.